Raymond R. Polk Sr., Charter Officer and Past Club President, was born in Sherman, Texas where he lived until joining the military in July 1955. He served for 35 years before retiring as the Sergeant Major of the U.S. Army Information Systems Command. He has been active in civic organizations such as the ETA XI Lambda Chapter of Alpha Phi Alpha Fraternity, the Geronimo Toastmasters Club, the Red Leg Chapter of the Non Commissioned Officers Association, Leadership Lawton/Ft. Sill Class of 1994-1995, Junior Leadership Lawton/Ft. Sill and the United Way of Lawton/Ft. Sill. Lion Ray is also a member of the Board of Directors for the Southwest Region Minority Business Opportunity Committee, the Salvation Army Advisory Board, the Lawton Human Rights and Relations Commission and the City of Lawton Personnel Board. Lion Ray is also the Vice-Chairman for the McMahon Auditorium Authority Board and the Chairman of the Board of Directors of the Northside Chamber of Commerce. Governor Keating appointed him to the Oklahoma Board of Private Vocational Schools. 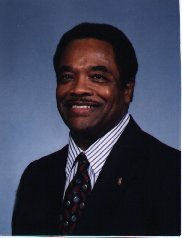 Lion Ray received the first William M. Lee Award of Excellence for 1996 from the Northside Chamber of Commerce, the State of Oklahoma Human Rights Award for 1996, Lawton Citizen of the Month for September 1995, Citizen of the Year for Psi Upsilon Chapter for Omega Psi Phi Fraternity for 1995 and the Regional Citizen of the Year for Omega Psi Phi Fraternity for 1995. Lion Ray holds a Bachelor of Science Degree in Psychology and Business Management from the University of Maryland, and has completed graduate level courses towards an MBA at Cameron University. He is a former Vice President of Citizens Bank, formerly the Executive Director for the Great Plains Chapter of the American Red Cross in Lawton, and is a member of the Union Baptist Church. Lion Ray currently serves as the Liaison for the Lawton Northeast On-Line Lions Branch Club.